For a brief moment on Monday I felt this feeling for the first time since my college summer camp job. In an attempt to find a market for myself in a community with a yoga studio on every corner, I've opted to go a different route: Yoga Parties. It's an excuse to get friends together, do a healthy activity, and maybe eat some food. How it works is this: You host the event and invite your friends and then I show up with my bag-o-ambiance, help set up, and then teach a yoga class all in the comfort of your own home! (or wherever else you want to hold the event). On Monday night a student from the yoga studio I work at hired me to teach at her Yoga Party! My very first. It was a blast! I showed up 30 minutes early to help her move her living room furniture into the bedroom and set up the ambiance. There were 6 students at completely different levels from yogi-first-timer to advanced-yogi. I taught a 1.5 hour Vinyasa Flow class. I feel like the class went really well! The atmosphere was light and the students vacillated between focus and laughter. Afterwards the party host brought out snacks and everyone sat in a circle on the floor and chowed down. It seemed like everyone had a great time! Until I get certified (June) my Yoga Party teacher fee is by donation (tips, if you will). Once I get more established I'll set rates. So get 'em while they're hot! 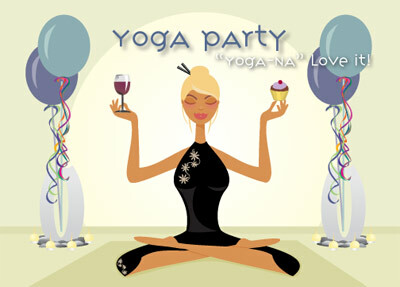 Contact me if you'd like to host a Yoga Party! Classes can go from 30min - 1.5hours from really mellow to super athletic - it's your party, it's your choice!